The great red brick Tudor palace where Henry VIII lived was enlarged and remodelled for William III by Christopher Wren in 1690. 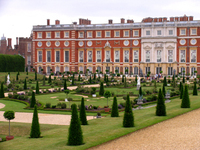 William of Orange had the gardens laid out in the French manner with three avenues radiating from the terraces in the form of a patte d'oie and they still stand in their original splendour. 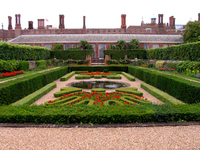 On the south side of the palace there are several small enclosures laid out as an Elizabethan knot garden, a Baroque garden and others. The maze retains its popularity but suffers from over use. 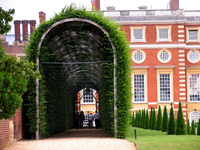 The Privy Garden was restored (1991-5) with the greatest concern for historical accuracy. In the editor's opinion, it would have been wiser to restore the Fountain Garden - because the Privy Garden was beautiful in its pre-restoration condition while the Fountain Garden (once the greatest semi-circular parterre garden in Europe) is somewhat ugly in its present condition. 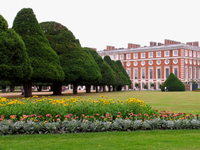 See: historic garden restoration case study of Hampton Court.